Much to the chagrin of students everywhere, back-to-school season begins earlier and earlier each year. Advertisements hawking backpacks, notepads and miscellaneous writing implements now follow fast on the celebratory heels of Fourth of July festivities. Once the season begins, companies inundate consumers with sales, leaving harried parents and college students overwhelmed and desperate for a cheap, easy solution. Stabilo Boss sought to differentiate itself from competitors in advance of the upcoming season by launching a memorable brand campaign in late spring. Stabilo Boss exists in a world of commodity products devoid of branding. These products compete and operate on the principle of price. Companies often forgo the challenge of differentiating these forgettable and expendable products. DDB Group needed to create a noteworthy campaign from the abject simplicity of an everyday office supply. 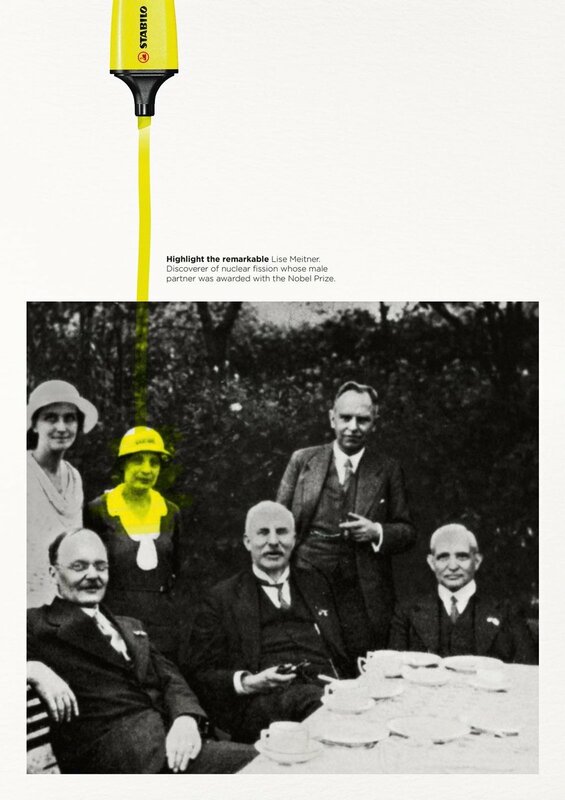 Stabilo Boss selected three famous black-and-white historical images to highlight the influential accomplishments of three overlooked and often uncredited women throughout history. The product literally and metaphorically highlights the women responsible for these achievements within the image and draws viewers’ eyes to the demure figures in the background. The campaign copy highlights the accomplishments of Katherine Johnson, the NASA mathematician responsible for calculating Apollo 11’s safe return to earth; Lise Meitner, discoverer of nuclear fission; and Edith Wilson, Woodrow Wilson’s First Lady, who assumed his responsibilities following a stroke. The agency sees this campaign as a challenge to the common societal attribution of history’s greatest triumphs to men. The campaign began running in print and outdoor in Germany during late spring of this year and will continue throughout the summer. It won gold in outdoor and silver in print at the Cannes Lions International Festival of Creativity and went viral within days of the Festival. “Highlight the Remarkable” earned Stabilo Boss and DDB Group international publicity and over 10 million impressions on Twitter alone. The campaign is ongoing, and social users have taken to suggesting additional women, such as Rosalind Franklin or Nettie Stevens, for future inclusion. "Everyone knows the phrase, 'Behind every great man is a great woman,' but what does it mean? That the man is always the hero, and the woman his sidekick? The truth is that all too often women are upstaged, and their actions and successes not mentioned," said Dennis May, DDB Germany Chief Creative Director. Cultural touchpoints resonate. — The tone of this campaign aligns with core generational truths that have grown to define our modern zeitgeist. Current social, economic and political events have centered the modern discussion around the recognition and validation of women’s issues. “Highlight the Remarkable” creates an intrinsic connection between these key ideas and the product. Honest connections trump timely statements. — The inherent connection between the concept and product in this campaign serves as a key component of its success. The call for communications that feel honest and authentic often comes into conflict with the need to comment on relevant calendar dates or social issues — such as International Women’s Day or LGBTQ Pride Month — out of fear of appearing unsupportive, prejudiced or antiquated. These executions cannot always function in concert with one another. Brands often fall flat on these issues, given the disconnect between their policies and their actions. Simplicity facilitates focus. — The simplicity of the campaign enhances the significance of the metaphorical and literal levels of meaning present in the work. The monochromatic images infused with a pop of color belay the multiple meanings without belaboring the point and obfuscating the message.